The US Agency for International Development (USAID) has launched the Comunitatea Mea program in Moldova. IREX will lead the implementation, with support from Tetra Tech ARD and the Urban Institute. This five-year program aims to facilitate Moldova’s decentralization process by strengthening local governance and citizen engagement. 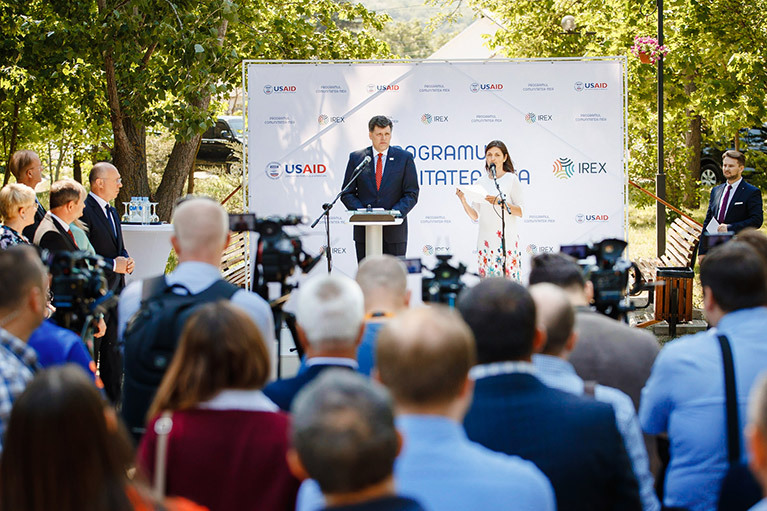 “USAID is proud to launch Comunitatea Mea, a $20.5 million USD activity that will strengthen local governments across Moldova—helping them to become more effective, transparent, and accountable to citizens,” stated Brock Bierman, assistant administrator for USAID’s Bureau for Europe and Eurasia, at the program launch event in Strășeni. Comunitatea Mea will serves as USAID's flagship local government activity, providing comprehensive assistance to 125 communities primarily by targeting local self-governing bodies. This assistance will be directed at building local government capacity to work inclusively with citizens, local businesses, and civil society to improve the quality of local services and foster constructive dialogue and partnerships. Local public administrations that demonstrate a commitment to open, inclusive, and accountable governance will unlock a technical assistance package that will allow communities to implement and manage needed infrastructure projects. The projects will fall into two major categories: community investments and intermunicipal projects. These projects will aim to improve the quality of community life. They will also help to rebuild citizens’ trust in local government’s ability to respond to citizens’ needs. The types of projects will vary to reflect the priorities set by each community. Some projects that are under considerations include construction and repair of buildings, roads, bridges, playgrounds, sports grounds, HVAC systems, water distribution and treatment facilities, street lighting systems, water tanks, and solid waste collection systems. Local public authorities will be required to contribute a significant amount in cost-sharing to ensure that projects are sustainable and grounded in community needs. To boost citizen engagement in this historic process, the project will provide technical assistance to civil society organizations, community initiative groups, and media outlets. Comunitatea Mea will also work directly with citizens to establish a platform for each actor’s involvement. The project will establish a pool of small grants for civil society organizations and community initiative groups to incubate and expand on successful models for transparency and citizen engagement.